While carrying a certain romantic image, cooking food outdoors over open fire has up until recently been a rather inefficient method, requiring both a lot of firewood and a lot of work for preparing it. However, in the last decade or so, a very fuel efficient type of field kitchens has arrived with the so called hobo stoves. These were at first very simple affairs, usually made out of beer or soda cans, with bigger ones made from coffee or food cans. Some of these were made for use with liquid fuel and others made for burning wood. Today, there are a number of high quality engineered alternatives, some simply using wood material and others using wood material, but working with wood gas in a secondary burn for extra boost. Today’s field kitchen belongs to the former category. 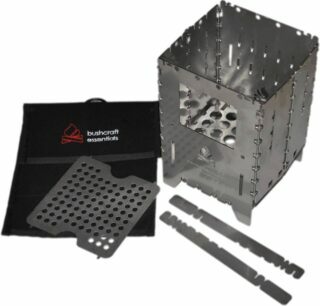 The Bushbox XL kit with heavy duty pouch and the universal grate for grilling, or to support liquid burner/solid fuel. Also the trivets that come with the box are displayed. 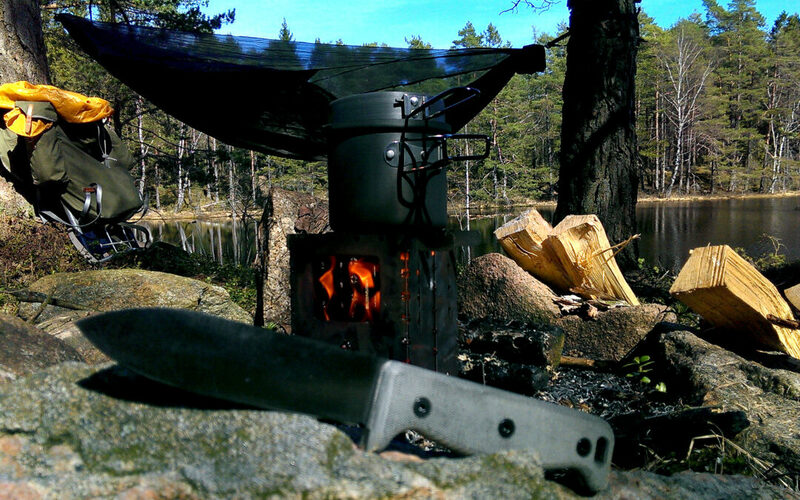 The Bushbox XL is manufactured in Germany by Bushcraft Essentials a renowned manufacturer who makes several field kitchens of this type, in various materials and designs. The Bushbox XL is made from 100% stainless steel and the quality of build is excellent. All the details are very nice, both with regards to design & engineering as well as manufacture, with no sharp edges and no quirks in setting things up. On its own, the Bushbox XL comes shipped in a cotton bag, but when ordered in the kit, it comes in a heavy duty nylon pouch that has a D-ring which can be used to attach the stove to your pack with. The pouch also has two nylon loops on the back so you can attach it to a belt or strap. Assembling and disassembling the box is incredibly easy as you only really need to pull it apart and shake it to assemble it. Things just fall into place as all the main components are connected with hinges. Disassembling, after it has cooled down, is equally easy as you just turn it upside down and let it disassemble by itself. Dissassembled it folds up to a very small space of a mere 19 x 12,5 x 1 cm, meaning it takes up almost no space in your pack. 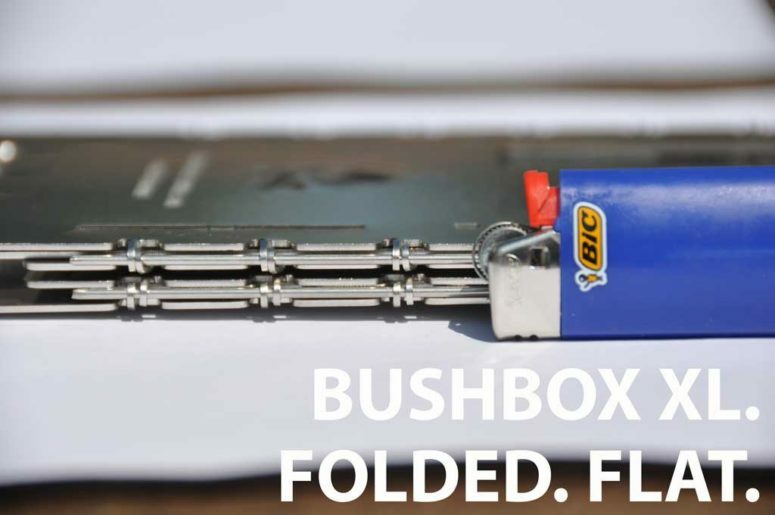 The Bushbox XL folds up to a neat 1cm thickness. Cleaning water by boiling it with the Bushbox XL. If you just order the box on its own, the included trivets, or the box itself, are used as a rest for pots and pans. Or, alternately, you can use regular tent pegs inserted into holes intended for such use, to support the pots. However, when ordered as a kit you also get a universal grate, which can also be used for grilling food, and to support a trangia burner, or for use with solid fuel like Esbit, or even for wood pellets or charcoal. The tent peg option is clever also as a backup option, should you lose a grate and need to improvise as most of us have pegs easily accessible. Normally though, you would use the grate that is included with the kit. Compared to some alternatives, the box is a fairly heavy kitchen, weighing in at 800 gr/1.76lbs. However, as you don’t need to carry fuel with you, in total it doesn’t add up to quite as much. And it also comes in a titanium version which is even bigger at 21 x 17 x 1cm, but which only weighs nearly half as much, coming in at a mere 490gr/1.08lbs (540gr/1.19lbs w pouch). Birch bark for starting fire, twigs and pine cones to feed it. As already mentioned, this type of kitchen is extremely fuel efficient. You don’t need to prepare regular firewood and instead you just pick twigs, pine cones and bark to feed it with. A couple of handfuls of small, dry twigs is quite enough for boiling a pot of water or cooking some food with. Alternatively you can also bring wood pellets or a liquid fuel burner with you. The Bushbox XL is easy to feed through the square opening, which is a great advantage to some of the kitchen offered by other manufacturers as there is no need to remove the pots to feed it. This opening also means you can use fairly long twigs and don’t have to break them all apart into small pieces. You can just keep pushing them in as they burn up. Air flow is also good, which is important in order for the oxygen to be able to feed the fire properly. This means that the wood burns hot & fast, so fast that you can actually boil water in about 5-6 minutes. Unlike some other field stoves I have tried, this stove feels quite solid and stable, and there is little risk of the pots tumbling over. And as you feed it from the side, there is no fuss that forces you to keep messing with the pots, again meaning little risk of knocking the pots over. While the heavy duty pouch is good, I would have prefered if the loops on the back could be opened and secured with velcro so you could easily attach this to a MOLLE system, making it easier to attach it on the outside of a pack or bag. Likewise, a carabiner would have been better than a D-ring, although this can of course be easily added by yourself. Starting a fire with a wood stove is done just like any fire. Start with some birch bark or other tinder, then just add a handful of thin twigs, then some thicker ones, or pine cones. Splintered logs can of course also be used if you chop them to suitable size. In wintertime or when raining, dry twigs can always be found at the bottom part of spruce. As always when you burn wood it will generate smoke and ash, and depending on your choice of firewood, how much is generated will vary. To keep your pots and the kitchen itself cleaner, it is generally better to choose “clean” wood like birch, rather than resin rich wood like pine or spruce, as the latter will generate more smoke and grime. That said, pine and spruce can still be used of course. And alternately you can use tin foil underneath your pots and let that get dirty instead, but that is of course a less environment-friendly solution. You should also be careful when choosing where to place the Bushbox as glowing embers will fall through and can cause fire to spread. Preparing the ground a bit first is good, but you can also again use a bit of tin foil or an aluminum pie pan to catch any falling ember. Keep in mind to turn the the opening of stove so that it is easy to feed the box from where you will sit before lighting it up, as it will be difficult to turn once it is burning. Never cool the box down with water or snow as that risks deforming the steel plates, ruining your stove. Bringing along some rags or an old newspaper to wipe off the stove with before putting it back into the pouch is also a good idea. Having used this type of kitchen quite a bit I have to say I really like them a lot and the BE Bushbox XL is one of the better ones I have tried. True, it is on the heavy side, and I am very curious about the Titanium variant, but given that you don’t need to carry any fuel it really isn’t an issue, especially if you like me, prefer to go off and remain stationary in a camp. 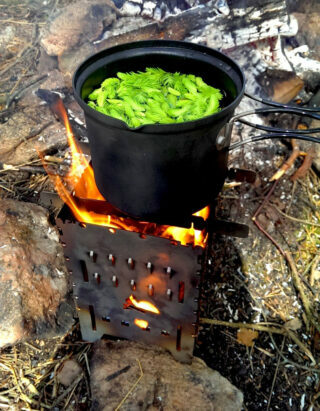 Compared to a regular open fire it is so much more fuel efficient and it takes almost no effort to use as firewood is ready just picked from the ground, while compared to gas or liquid/solid fuel burners, the feeling of cooking over fire is a whole lot more “true” and back to the roots. It just feels right to cook over fire. So for a camper or hiker who prefers wood fire but who wishes it took a bit less work, or if you wish to leave as little trace in nature as possible, this is an excellent option. Likewise, for a prepper or survivalist, who shouldn’t rely on the accessibility of gas, liquid or solid fuel, this is a wonderful kitchen that will keep you running for a very long time. Looking to the manufacture and design it is just excellent and based on the use over the last year or so, I expect this to last a lifetime, which makes the initial investment seem quite cheap in the long run, not least when considering that the fuel is free. Should any part get lost, it is also quite easy to order spare parts directly from Bushcraft Essentials. All in all, this is just a fantastic field kitchen that should suit everyone but the ultralight hikers. 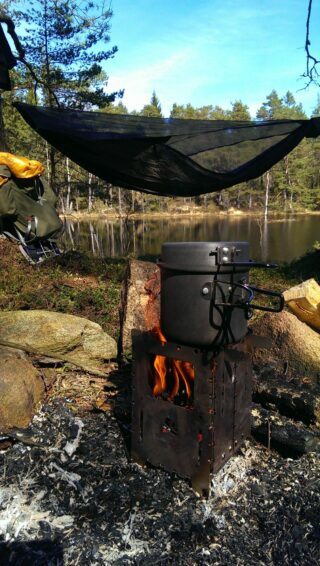 For those the 70gr/0.15lbs Bushcraft Essentials Ultralight Pocket Stove would be a far better alternative.